You can import all services recorded for the project (times & expenditures) directly from a project to an invoice in a few clicks of the mouse. 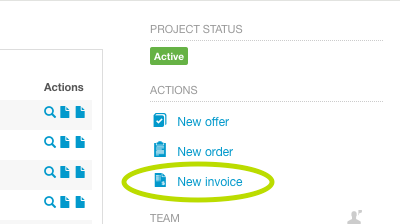 To do this, open the desired project, select the tab "Document flow" and click on the button "New invoice" on the right-hand side under "Actions". 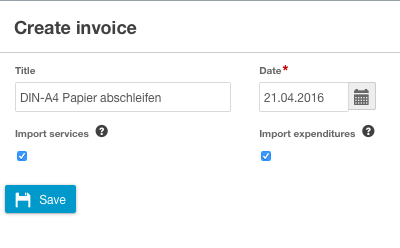 In the modal box that is subsequently opened, you can choose whether you want to transfer all services (times) and expenditures directly to the invoice. You also have the option of adapting the invoice title and creation date. Clicking on the button "Save" imports the services. The rounding settings for times defined in the master data are taken into account. Consult the report "Define and apply rounding settings" for more information on the topic of rounding settings. How do I create a monthly invoice? What do I need to know about accounting?